A summary of each lesson and its key social principle is presented below. A vital component of successfully teaching social skills is clearly communicating the underlying social principles to all involved. Click on the lesson titles below to see these details. You can click on the title a second time to hide the details and reduce the clutter. Click on the lesson titles to see more detail. You can click on the title a second time to hide the details and reduce clutter. The set of skills required to successfully greet and farewell one another are complex, and critical in friendship. This lesson explicitly teaches children how to offer friendly greetings and goodbyes. Key social principle: When we meet and say goodbye to people in friendly ways we attract friends. 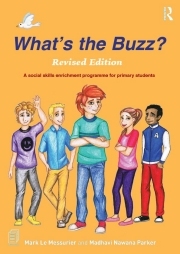 The aim of this lesson is to examine how to get attention through the use of 'friendly behaviours'. As children gradually experiment with what works, and what others find acceptable, the scope for more successful communication begins. Key social principle: We get the attention of others to have our needs met. The best way to get attention is to use friendly behaviours. When people find us friendly they usually want to listen and help. The aim of this lesson is twofold. First, it is to set in motion the participants' interest to follow directions. Secondly, to skill both parents and educators in approaches that should 'kick start' a beginner’s desire to do so. Key social principle: We follow instructions given by parents and teachers because, usually, there is a good reason attached to it. When we follow instructions we will look friendly and cooperative. This lesson highlights the skills required so others see us as 'being friendly'. Key social principle: When we use friendly behaviours people see we are likely to be a good friend. This lesson reviews the essential facts about playing games, competition, winning and losing. The students explore practical ideas on what to say and do following a win or a loss. It highlights that the best way to look like a winner every time is to enjoy the game by playing for fun and friendship. Key social principle: Playing and winning feels good. However, if we get angry or sulky when we lose others will not like us. In the end, they will not want to play with us. A TRUE WINNER is someone who can show friendly behaviours when they win or lose. This lesson is the first of four with an emphasis on feelings. It aims to help students identify their own feelings and the feelings of others. In addition, it teaches children to predict situations that are likely to cause a rush of particular feelings. Key social principle: We all show feelings when things happen to us. We manage them best when we can tell exactly what they are. People also appreciate when we pick up on how they are feeling and show care. In this lesson children are taught how to recognise their early warning signs. One of the most powerful benefits arising from the activities in this lesson is that students are given opportunities to talk and listen to others. This sharing of early warning signals helps to validate feelings that many tend to ignore or misunderstand. Key social principle: We all have feelings as things happen to us. When we show we can deal with our feelings in helpful ways people feel good about us, and choose to be around us. This third lesson about feelings moves the focus to making positive choices as a healthy response to the many emotional situations experienced. It highlights the power of thinking positively, and how to do it. Key social principle: How we think controls how we act. When we think and act in positive ways people see us as friendly. This lesson explores sensible ways for children to take care of their emotional health. With a collection of 'calm-down' options to draw from students can begin to trial new ways to manage life stresses more effectively. Finding ways to de-stress and live life more calmly helps each one of us to meet life’s many challenges with greater composure. Key social principle: As we learn how to take care of our emotional health we think more positively and stay calmer in times of trouble. In this lesson students are taught how to read the emotional needs of others and respond to them more empathically. To do this, two processes must occur. The first is to acknowledge how the other person is feeling. Next, something should be said that eases that person’s difficulty, or allows them to see there is a possible solution. Key social principle: Other people often have thoughts and feelings that are different to our own. It is important we show care about what others may be thinking or feeling, even when we do not completely agree or understand. In this lesson students are taught that worrying, generally speaking, is normal because it helps us to make sense of our world. We also teach that most of us do best when we learn to understand our worry patterns and develop a few practical calming strategies to prevent ourselves becoming too anxious. Key social principle: Worry is normal; it helps to make sense of things we feel unsure about. When worry gets too much we must find ways to lower our fears. The purpose of this lesson is to review the facts about disappointment as it is such a challenging emotion for most to deal with. In this very practical session participants practice how to think so they might deal with a disappointment more positively. Key social principle: Things do not always go the way they should. This causes disappointment. When we understand how disappointment works and learn how to deal with it, we stay in a much better position to make positive decisions. This lesson alerts students to exactly what bullying behaviours are. Students who are bullied are more likely those who struggle with pro-active social thinking. Quite a few are not sure how to recognise a bully, and when they do, they respond in a way that gives the bully satisfying feedback. Similarly, quite a few find themselves being accused of bully behaviour because they cannot express their feelings aptly. Key social principle: Bullying is wrong. When we learn what bullies want we learn how to behave around them so we stay safe, and they do not get enjoyment from their bullying. This lesson contains the necessary tips to develop conversational skills. It reassures participants that conversation can be tricky. With so many skills involved, as well as great timing required, it is not surprising that for those already wrestling with one developmental issue or another, the art of conversation ispuzzling. Key social principle: It’s great to talk to people about the things we are interested in, but it is important to listen to the things they are interested in. When we do this we are more likely to attract friends. The aim is to show students how to use other people’s actions and energy as a compass to monitor their own behaviour. Once we begin to pick up on these cues we provide ourselves with the best chance to regulate our behaviour and make it socially appropriate. The lesson also begins to explore the concept of self-awareness; to understand one’s natural style, whether it is working and if there is scope do make changes. Key social principle: Friendly behaviour starts by noticing how others are talking and behaving. When we see this and use it as a signal to do the same we 'fit in' with others. As we 'fit in' others feel happy about us being part of their group. The final lesson examines what a compliment is; its value, how to deliver them and how to receive them. It looks at their versatile role in day to day interaction because they can be used to cheer someone up, to start a conversation, and to build warmth and loyalty in friendship. Key social principle: When we say pleasant and caring things to others, they feel good about themselves and about us.